Will the 'Land of Snows' succumb to a massive influx of visitors? Tibet in the summer of 2006 is a culture struggling to endure amid a tsunami of tourism. As the Chinese government invests massively in infrastructure projects to strengthen its political influence and bolster its claim as "liberators," ordinary Tibetans are struggling to stay afloat. Much has been written about China's re-population of Tibet, but over the past few years, and particularly since the opening of the Qinghai-Tibet Railway this July, the number of Han Chinese tourists has skyrocketed. Whereas just a few years ago they made up only a handful of tourists to Tibet, today they are now the single largest majority of visitors. A current Chinese ad campaign states that Tibet is "a destination like no other," but its days may be numbered as one of the world's most distinctive cultures. The 240 kilometer drive north from the capital Lhasa to Nam-tso, one of Tibet's five holy lakes and the highest saltwater lake in the world at 4,718 meters, reveals how in just a few years the region has been transformed. 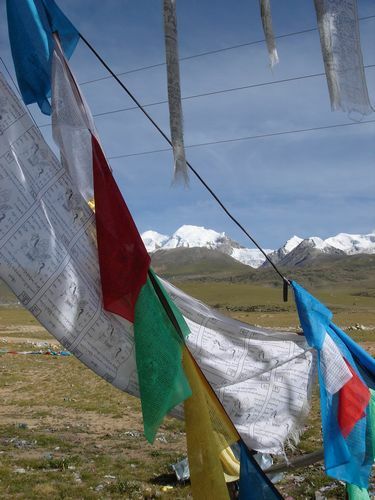 Along the Qinghai Highway, Tibet's traditional blue, white, red, green and yellow prayer flags share the pride of place alongside the obligatory Chinese national flag in villages and on the rooftops of homes. As with images of His Holiness the exiled 14th Dalai Lama, any sign of Tibet's national flag is strictly forbidden. 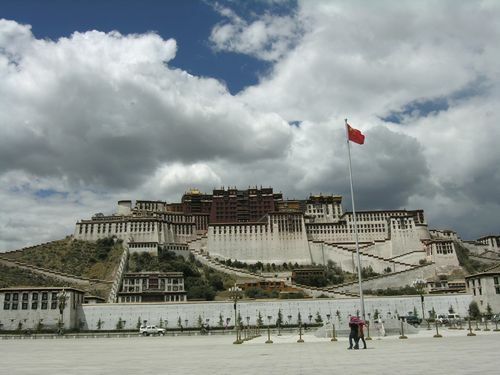 Nam-tso's relative proximity to Lhasa makes it a convenient day trip. At the halfway point is a new rest stop carved out of the grasslands and hosting a dozen or more tour buses. A new garish Chinese-made statue of two large hands provides a photo-op while local Tibetans try desperately to sell cheap Nepali-made Buddhas and prayer wheels as souvenirs. Across the road, the pristine Nyenchen Tanglha, a snow capped glacier, towers serenely in the distance. 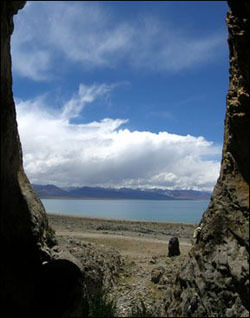 Tibetans believe that the mountain is a male god and is married to the goddess of the lake, Namtso Chungmo. In the field opposite the statue, long lines of prayer flags ripple in the breeze. The new train line crisscrosses the Qinghai Highway for half the journey, traveling at over 100 kilometers in places past yaks, horses and sheep. 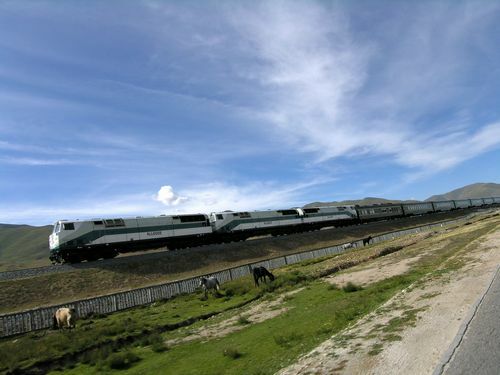 Since July 1, six arrive and depart every day from Lhasa's brand new railway station, about 10 kilometers outside the city center. Soon the highway begins its ascent towards Nam-tso. A new traditional Chinese gate straddles the road marking the entrance. The current admission fee of 80 yuan (US$10) per person has doubled in the last year from 40 yuan ($5) last summer. The 40 kilometer road was only finished last year making for a far smoother ride and an easier day trip from Lhasa. Before it was finished, buses or SUV's had to drive over marsh land and frequently would get stuck in the mud. The trip would usually include one night's camping. As the road winds uphill to the Largyen-la pass at 5,190 meters above sea level, as high as the base camp at Mt. Everest, the spectacular sky-blue lake comes into view. 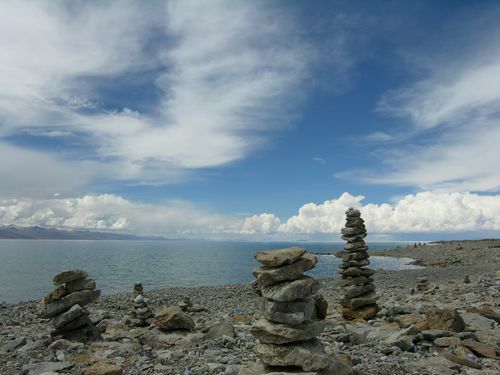 Since Nam-tso is considered a holy lake swimming is a major taboo, as are boats and fishing. The road then descends over rolling grasslands filled with roaming yaks and sheep belonging to the Drokpas, Tibet's traditional nomads. For part of the year they reside in black tents selling yak yoghurt and cheese to passing travelers. At the lake front immediately adjacent to the car park hundreds of tourists gather where just a few months ago a handful could be seen. For now a 10 minute walk will leave the crowd behind and allow for the silent communion Nam-tso offers. 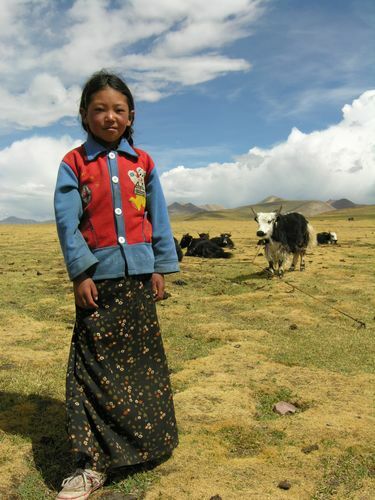 Drokpa girl and her family's year-old yak. 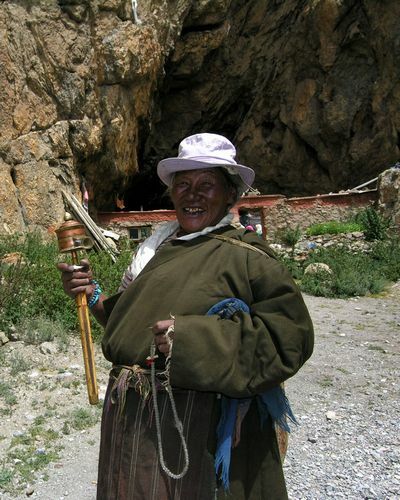 Most Tibetan pilgrims do a traditional clockwise circumambulation known as a kora around a small hill they revere as the goddess Namtso Chungmo's body. It takes about an hour and is believed to bestow blessings on those who complete the route. It's a beautiful walk shared with a few pilgrims spinning prayer wheels and muttering mantras, while Nam-tso reflects the sky's ever-changing moods of deep blue azure mixed with the foamy white of passing clouds. A Tibetan pilgrim doing the kora. Across its 30 kilometer width resides her lover, the same snow capped Nyenchen Tanglha, spied previously from the highway on the other side of the mountain range. On this day he wears a veil of clouds and refuses to completely reveal his icy facade. As the world's most populous nation turns Tibet into a vacation hot spot just how long this brief respite from the maddening influx of tourists will survive is doubtful. For most Tibetans, the answer lies in the tenor of one's faith. Unfortunately for Tibet and the world, the Chinese authorities have displayed little regard for matters of the spirit.